This is a report from the economic fringes by Gary Rivlin, who spent two years writing this expose of the "poverty industry." While doing his research, Rivlin hung out at the annual check cashers convention, spent time in Tennessee with the small-town debt collector who founded the $40-billion-a-year payday cash advance industry, and met with a number of mercenary entrepreneurs who are getting tens of millions of dollars rich selling high-priced products to the country's hardworking waitresses, warehouse workers, and mall clerks. 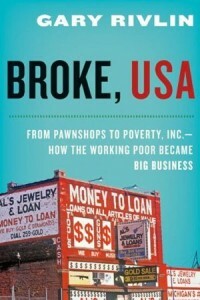 This book shows that preying on vulnerable consumers is big business. In fact, Rivlin finds that the poverty business is now larger than the casino industry, another business model that preys on vulnerable consumers. He chronicles the early roots of the subprime meltdown and explores other brilliant (or diabolically brilliant) ways businesses have devised to grow very, very rich off those with decidedly thin wallets. The book also profiles a few of the more committed consumer advocates who are fighting back against the major corporations, chain franchises, and newly-hatched enterprises that grow fat with profits at the expense of the working poor.